John Mueller addressed this and whether sites need to optimize for “near me” specifically, or how Google is determining this. So as far as I know, we mostly look at this with regards to location, so doing things like adding “pizzeria near me” as a title of your pages on your website probably doesn’t make that much sense because we would try to figure out like what is actually near the user. So in order for us to be able to figure that out properly, now there are two things you can do. One is obviously put your address on your website and to mark that up appropriately with structured data so that we understand where your location is. The other is to set up a Google My Business local listing so that we know where your business is located and can connect that to your website as well. In practice, if you are a sushi restaurant in Kansas City and you optimize for “sushi near me,” how many of those searches will actually be near Kansas City anyway? Probably not that many. And especially for titles, you could probably use those keywords for something optimized for your local area, such as the street or neighborhood, instead. And when you do your own Google searches for places or businesses and include “near me,” chances are not many – if any – of those results have optimized for the “near me” keyword phrase at all. For example, you can easily see it when you do a search for “pizza near me” and then do a second search for the same phrase, but with “near me” in quotes – the results are probably much different – in my search, the first actual pizza place listed for the second phrase was hours away from me. 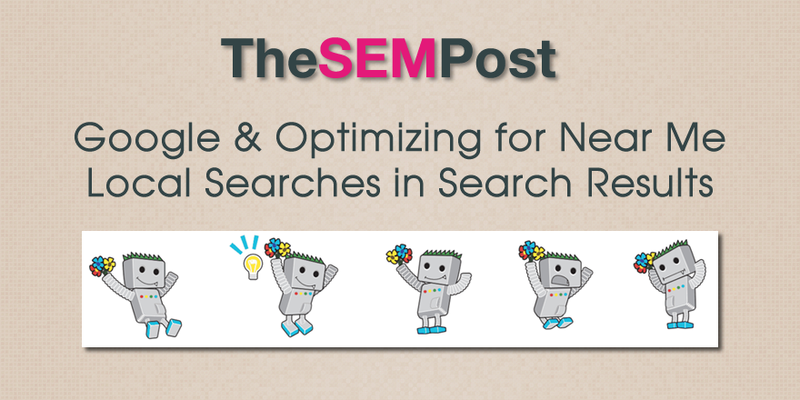 That all said, if you want to optimize for “near me”, then it doesn’t hurt as long as you aren’t sacrificing other more useful keywords. But it probably won’t be long before Google will ignore that phrase, or reduce its effectiveness, in order to provide the best search results. And again, make sure you are utilizing Google My Business features and address/directions on your website. Location signals are far more important for showing up on these “near me” searches than the keywords themselves.